From left, TV Asia chairman and CEO Padma Shri H R Shah; Pandit Jasraj; Tripti Mukherjee, founder of Pandit Jasraj Institute and Sandeep Chakravorty, India’s Consul General in New York, unveiling the maestro's first authorized biography during a book release ceremony at the TV Asia auditorium in Edison, NJ on July 17. EDISON, NJ: TV Asia chairman and CEO Padma Shri H R Shah and Indian Consul General Sandeep Chakraborty, along with legendary classical vocalist Pandit Jasraj, unveiled the maestro’s first authorized biography, “Rasraj Pandit Jasraj,” during a book release ceremony at the TV Asia auditorium in Edison, NJ on July 17. The event was jointly hosted by TV Asia, the Consulate General of India in New York, and the Pandit Jasraj Institute and broadcast live on TV Asia across the US. The event was also the first public gathering in the US announcing the launch of the biography, before the official India release later this year. Earlier, while introducing Pandit Jasraj, TV Asia chairman and CEO H R Shah offered an analogy, saying the legendary classical vocalist was a “rare gem” with a large fan-following despite the challenging nature of his music that yet transcended all age groups. 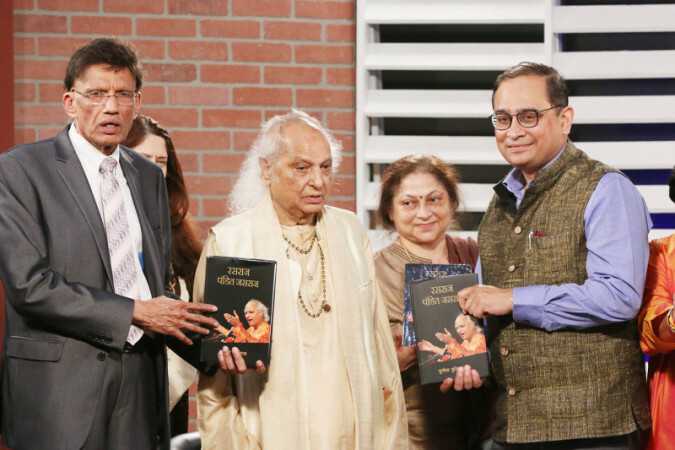 Shah and Pandit Jasraj unveiled the book on live TV. The biography is written by Sunita Budhiraja and published by New Delhi-based Vani Prakashan. The biography’s release at TV Asia was followed by a 90-minute interaction on TV Asia’s “Focus Live” with Pandit Jasraj; Consul General Sandeep Chakravorty; Durga Jasraj, Pandit Jasraj’s daughter; author Sunita Budhiraja; publisher Arun Maheshwari and TV Asia host and senior producer Vikas Nangia, followed by a question-answer session with the audience.